How can you be more effective in your homeschooling? If you are like our family, then you feel that you still don’t have this homeschooling thing all figured out yet. Most of the families I have spoken with, no matter the how long they’ve homeschooled, have said they are still learning and making adjustments. Yet, a simple change in your habits can help you be more effective. Just like those principles changed the minds and lives of many, I think they can do the same for our homeschooling lives. 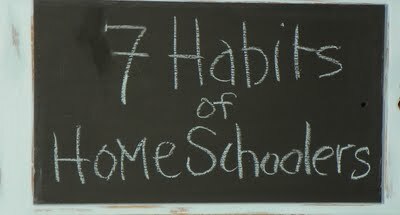 Below is a look at how the 7 habits can help you and I be more effective homeschoolers. 1) Be Proactive. Take responsibility and initiative in your homeschooling. What are the passions of your family, and of each child. Structure your learning around these areas. If your child is having difficulties in a particular area or subject, then seek out help. Help can be in the form of resources found online, or at the library. Help can also come in the form of tutoring. Bottom line is to find solutions to the problems you encounter. 2) Begin with the End in Mind. What is important to you and your family? Why are you homeschooling? What will the result be when your homeschooling is over? Ask yourself these questions. I encourage you to create a homeschooling mission statement and refer to it often. Each school year, define the most important 3 goals for the family and for each child. Keep them handy as you tackle each daily task and assignment. 3) Put First Things First. The best homeschooling doesn’t function in a checklist manner the way tradition school does. When you know habit #2, then structure your days according to reaching your end result. Plan based on reaching your end, not based on urgency or checking off days or subjects. Your plan may not be a typical M-F plan. Your plan should reflect and fit into what goes on in your family. We personally know families that homeschool 3-4 days per week, or just weekends. Make your plan and work your plan. 4) Think Win/Win. How does your homeschooling benefit others? Find ways that you can use the flexibility of a homeschool schedule to work to better your community. Community projects with your family can be great learning experiences, and can spark something in your children. Within your family, create solutions that will help the kids learn and complete the assignments they are working on, while also having fun and the free time they desire. If they have fun when they learn, then they will never stop trying to learn. 5) Seek First to Understand, Then to Be Understood. Homeschooling will challenge you to your core, within your household and outside of it. Spending that much time with anyone, not just your kids, will open up opportunities to disagree and sometimes get frustrated. When your child is frustrated by something, or doesn’t want to do something, do your best to understand the root of this. Seek to understand why and what they are dealing with then you can go toward them understanding you. This will create an atmosphere of care, respect, patience, and problem solving. Many people do not understand homeschooling and can say insensitive and sometimes crazy things. Before bashing them with why homeschooling is better, seek to find out why they believe that, then begin to show them why you believe in homeschooling for your family. 6) Synergize. Homeschooling doesn’t mean you never leave your home, nor does it mean you have to go at it alone. Find other families in your community that you can meet with and learn with regularly. Many people call this a homeschool co-op. Share with one another, learn from each other, and encourage each other (our family uses a curriculum called Classical Conversations and has formed a Classical Conversations Community with several other families). Also, many organizations (museums, zoos, government) do special things for homeschoolers. Find them, frequent them, and tell others about them. 7) Sharpen the Saw. Homeschooling is a lifestyle. A lifestyle that creates and encourages lifelong learning. Rejuvenate yourself, your family, and your homeschooling by working on all the habits continually, and by putting the lessons learned in homeschooling to work in family and even a family business or mission project. Homeschooling is a wonderful way to educate your children and create a lifestyle centered around family and learning. Highly effective homeschooling is possible for all families! I encourage you to begin to put these 7 habits into practice and enjoy the results that come from it. Question: Is there an 8th habit that you can add? Please share in the comment section below.